Archibald Edward Cook, known as Archie, was the third son of William Cook (a mariner) and his wife Elizabeth. He was born on 6 June 1892 in Saul. William's business flourished, and by 1901 he had moved his family to Elsie Villa (now Cider Press House) which he certainly owned by 1909. Archie's older brothers, William Frederick and Frederick Gilbert Alexander had left home by 1911, but Archie, then a postman, remained there along with his older sister, Elsie, and younger siblings, Ivy and David. 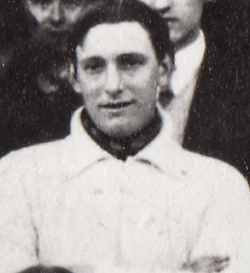 Archie enlisted into the Royal Naval Reserve on 24 August 1915 at Gloucester and reported to the Devonport training school, HMS Vivid, on 6 September with another local man of the same surname, Raymond George Cook. His training being completed on 30 November, he was posted as a deck hand to the old gunboat Sabrina; during his 18 months on board she was converted into a diving tender and operated from Devonport. He then spent some six months in the new destroyer Osiris and another four aboard Valhalla, before starting a series of short spells in a variety of ships; an old cruiser, Abercrombie, a new monitor (a fairly small warship with one or two huge guns that were fixed to fire forwards, usually for bombarding shore targets) and possibly a troopship. He completed his engagement aboard HMS Halcyon, an obsolete paddle-driven minesweeper, and was demobilised on 9 September 1919. Two days after his discharge, Archie was awarded a disability pension on account of orbital cellulitis, an infection of the tissues of the eye socket which leads to inflammation and swelling; the pension continued until at least 1925. He was awarded the British War Medal and Victory Medal and his service is commemorated on the plaque in the village hall. Archie's marriage to Mary Ann Wothers was registered during the first quarter of 1919 in the Wheatenhurst district. They lived in Bath Road, Eastington, with a growing family and Archie was recorded as a labourer in 1939. In the autumn of 1940 he was off work for 17 weeks with stomach trouble, said to be due to old war wounds, during which time he suffered a heart attack. On his first morning back, Saturday 14 December, Archibald Edward Cook was cycling to work when he met with a fatal accident, the exact circumstances of which were not determined despite the BBC broadcasting an appeal for witnesses and information. He was found at the bottom of Whitminster Pitch on top of his badly damaged bicycle. The evidence suggested that he had been hit by a motor vehicle, probably a lorry, the driver of which was not traced and the inquest recorded an open verdict. Archie was buried in St Mary's churchyard, Fretherne, on 18 December.